Julia was born in Carthage of distinguished lineage. When the Persians captured Carthage many people were taken into slavery. 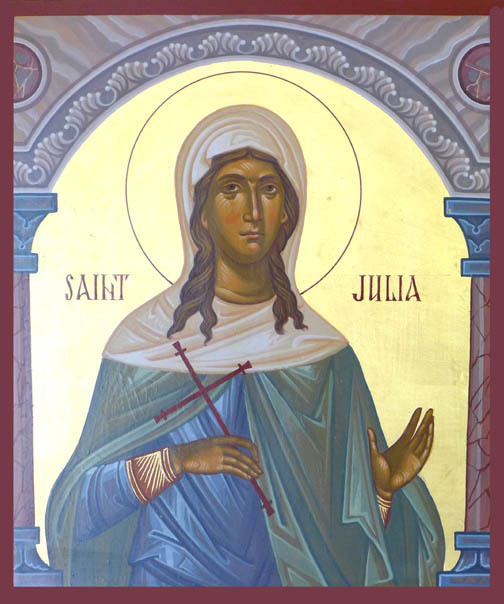 Saint Julia was captured, enslaved and fell into the hands of a merchant in Syria. That merchant was a pagan. Seeing that Julia was a Christian, he counseled her on many occasions to deny Christ and become one in faith with him, but Julia could never agree to this. Since Julia was faithful and trustworthy in service, the merchant left her in peace and did not speak to her about faith again. On one occasion, the merchant loaded the boat with goods and took Julia along with him and sailed to distant lands on business. When they arrived at Corsica, there was a pagan feast and the merchant joined in this blasphemous offering of sacrifice, but Julia remained aboard the boat weeping because so many men lived in foolish error and did not know the truth. Somehow the pagans found out about her, removed her from the boat, even though her master objected to this, and then began to brutally torture her. 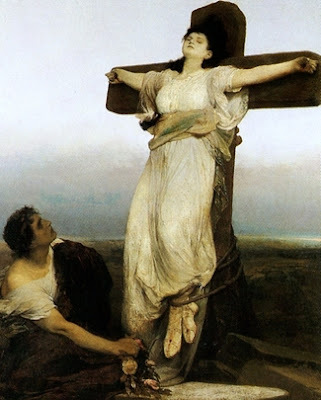 They severed her breasts and threw them on a rock and, after that, they crucified her on a cross, upon which Saint Julia gave up her soul to God. Her death was revealed by an angel of God to the monks on the nearby island of Margarita or Gorgona and the monks came and honorably buried the body of the Martyr. Many miracles appeared at the grave of Saint Julia throughout the centuries and from the other world she herself appeared to some. She suffered honorably in the sixth century. After many years, the faithful wanted to erect a new church in another place in honor of Saint Julia because the old church had become too small and dilapidated. Therefore, they gathered building material on a new site: stone, bricks, sand and all else that is required. It so happened that at night, on the eve of the day when they intended to lay the foundation, all of this material was moved to the site of the old church by an invisible hand. In confusion, the men again carried the materials to the new site, but the same thing happened again: the material was removed to the old site alongside the old church. The night watchman saw a young maiden "all aglow" on white oxen, carrying the material to the old church. From this everyone understood that Saint Julia did not wish that her church be built in another place, so they demolished the old church and on that same site built a new one. The power of the Honorable Tree. Her faith, she did not conceal. "Woe to the evil judges"
That righteous blood, they shed!